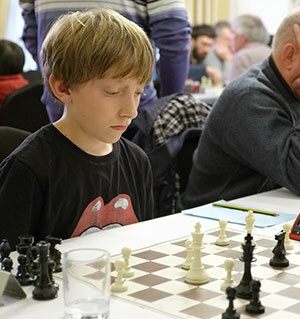 The British Rapidplay Chess Championships is the second stop of the season on the journey towards qualification to the National Chess Junior Squad (NCJS). This years’ event took place over the weekend of 24th-25th November in Ilkley, Yorkshire. The Saturday saw a 5 round rapidplay for U11s hoping to gain enough good performances (‘half-norms’) to be invited to the U11 team trial in April. Three Sussex players achieved a half-norm – Adam Faulkner, Abhi Jadav and Theo Lawson; Adam came joint second place with 4/5. As Abhi had already secured a half norm in Nottingham in October he has secured his invitation to the trial. For those seeking to qualify for the NCJS as over-11s the British Rapidplay provides an opportunity by entering the 2-day grade-limited event. Six Sussex players entered the Minor section; the stand-out performance was from Ben Crosby who came joint first with 8.5/11, earning a half norm. Also gaining their first half norms were Tom Howeson and Raina Jithendra (both 6.5/11), and good scores but just missing the half-norm threshold from Oliver Faulkner and Jacob Wynn. Not content with his performance on Saturday, Adam Faulkner also entered a one-day rapidplay on the Sunday coming joint first with 5/6.